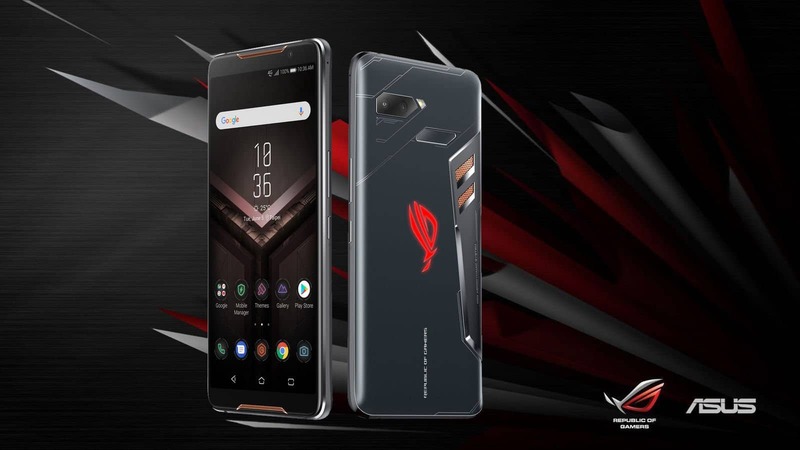 Last month, ASUS launched the Zenfone Max Pro M1 and now, Republic of Gamers (ROG), a subsidiary brand of ASUS has announced the new ROG Phone. Today, some ROG products were launch and the ROG Phone is the highlight of today’s announcements. The ROG Phone is the world’s first smartphone with a 3D vapor-chamber cooling system and other numerous features like Ultrasonic AirTrigger touch sensors, side-mounted ports optimized for landscape-mode, an AMOLED display with HDR, 90Hz refresh rate, and a 1ms response time. The ROG Phone is powered by the Qualcomm Snapdragon 845, which is found on other flagship phones as well, but ASUS has customized the chipset to achieve a massive clock speed of 2.96GHz, coupled with Adreno 630 GPU and 8GB RAM. The phone comes with 512GB internal storage. In terms of camera, the ROG Phone has a dual camera setup on the back with a 12MP and an 8MP sensor, while on the front there is am 8MP selfie camera. Connectivity options on the phone include Wi-Fi 802.11a/b/g/n/ac/ad, Bluetooth 5.0, GPS, AGPS, Glonass, USB Type-C port, NFC, and 3.5mm jack. It is also packed with all kinds of sensors- Accelerometer, Ambient Light Sensor, Compass, Gyroscope, Proximity Sensor, and Ultrasonic AirTrigger Sensor. There is a big 4000mAh battery inside which is rated to deliver 7 hours of gameplay on Wi-Fi. also, it comes with Fast Charging and ASUS claimed that the phone can be charged from 0%-60% in just 33 minutes. The phone also features dual stereo speaker on the front for a great audio experience while gaming. ROG also announced a new ROG Delta gaming headset that can be connected to the ROG Phone and other smartphones via USB Type-C port. The ROG Delta features an ESS quad-DAC and drivers with audio signal diversion technology. The company revealed that the ROG Phone scored 304183 points in AnTuTu Benchmarks and this score is much higher than similar phones and flagships including the Xiaomi BlackShark, Samsung Galaxy S9+, Apple iPhone X, and Razer Phone. The phone sports a 6-inch full-HD+ (1080×2160 pixels) AMOLED display with 90Hz refresh rate, 1ms response time and a high contrast ratio of 10000:1. The Asus ROG Phone sports the GameCool vapor-chamber cooling system, with detachable AeroActive Cooler for extra cooling. There are two programmable ultrasonic AirTriggers and advanced force-feedback haptics. The phone also has a Mobile Desktop Dock for desktop-style gaming and a Gamevice controller with WiGig Dock using 60GHz Wi-Fi for big-screen gaming. Just have to look at this YouTube promo video to have a quick glimpse into what the ROG Phone can do. ROG Phone features a unique range of optional expansion peripherals designed to take the mobile gaming experience to new heights. The TwinView Dock turns ROG Phone into a powerful dual-screen console for the ultimate gaming and live-streaming experience. As well as a 6-inch AMOLED (2160 x 1080) auxiliary screen that’s great for split-screen live-streaming, extended game display or group communication, it packs a front-facing quad-speaker system, two extra physical trigger buttons, dual-haptic force-feedback engine, an enhanced cooling system and a high-capacity 6000mAh extended battery pack. The Mobile Desktop Dock allows gamers to connect ROG Phone to an external 4K UHD monitor, mouse and keyboard. ROG Phone can be used as an auxiliary display, hooked up to a wired gigabit LAN and drive a 5.1-channel surround-sound system via the SP/DIF output. With the Gamevice controller and the WiGig Dock — using 60GHz 802.11ad Wi-Fi — ROG Phone morphs into a portable console with a full inventory of physical gaming controls and ultra-low-latency wireless display connectivity for a seamless big-screen gaming experience that’s perfect for group viewing. It packs dual analog joysticks, left and right fire triggers and bumpers, a D-pad, along with A, B, X, Y and L3, R3 buttons. However, all these are optional expansions to enhance the gaming experience. ASUS has stated that the company will bring the ROG Phone to India soon, but no announcements have been made regarding the pricing or exact launch dates yet. Previous articleWhat will the future of AI look like?